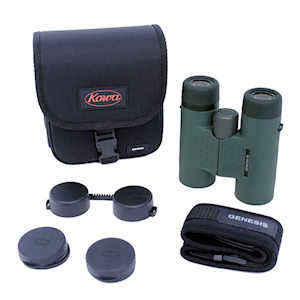 Kowa 8x33 Genesis XD33 binoculars are a favorite of birders looking for an exceptional lightweight, mid size binocular with a super-wide field of view. They are made with four Kowa Prominar XD lens elements for incredibly bright, highly detailed images. These fully multi-coated binoculars feature phase coated Schmidt-Pechan roof prisms, which are treated with Kowa's C3 reflective coating for maximum light transmission and vivid, distortion-free images. The magnesium frames make them lightweight (under 21 ounces) but durable. Kowa Genesis 33 binoculars are also completely waterproof and internally fog-proof. Field of View: 420 ft. at 1000 yds. Dimensions: 5.59 x 4.96 x 2.56 in. Product Weight (oz): 20.8 oz. All Kowa spotting scopes, binoculars, or other optical products sold through a United States or Canadian authorized Kowa dealer come with a Limited Lifetime Warranty*. This warranty gives you specific legal rights and you may have other rights which vary from state to state. Your Kowa spotting scope, binocular, or other optical product is warranted to be free of defects in material and workmanship for the lifetime of the product. Please call Kowa office to receive an RMA (return merchandise authorization) number before shipping the product to Kowa. Prominar XD (extra-low dispersion) glass lenses combined with premium coatings offer reduced chromatic aberration to create clearer, color-accurate images. Phase-Corrected and C3 reflective coatings on the Schmidt-Pechan prism increases light transmission for image brightness, contrast, and color fidelity. Outstanding Close-Focus at 4.9ft. which is great for closer observation of birds or insects. Widest Field of View ranging 420ft. @ 1000 yds. which rivals other models in this range. Nitrogen filled to prevent fogging. 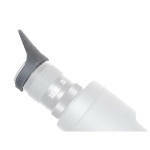 Large, textured focus wheel for a great grip and a smooth resistance for accurate focusing. A thin rubber armored housing made of Magnesium offers low weight, and prevents damage from minor impacts. Larger twist-up eyecup design which sit more comfortably around the eyes for sustained observation and decent eye-relief for eyeglasses. Lockable Diopter, unlike some models where you can easily knock one barrel out of focus. This is very convenient for keeping the binocular focused to your particular eyes. The Kowa Genesis 33 series are designed to rival any 32mm binocular thanks to slightly increased light transmission for brighter images while maintaining a small and compact form in this price range. Understanding Prominar XD glass: The Genesis Series incorporates Kowa’s “PROMINAR XD” lenses. 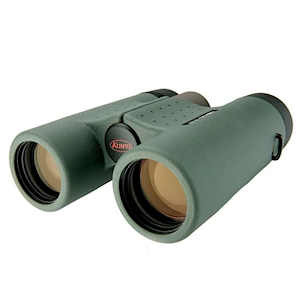 To attain the highest point of binocular performance, a total of 4 XD lenses (2 sets of 2 lenses) are utilized in the objective end of the binoculars. What do these XD lenses do? Well when light passes through a prism, it causes a dispersion (spreading out) of the colors. XD glass reduces this dispersion of chromatic (color) aberration and therefore creates a much sharper image with more accurate color fidelity so you can see the important details in your target. However, this type of glass is much more expensive to manufacture and is thus found in higher end optics. This is the one of the reasons for the Genesis series being at the top of Kowa’s product line. 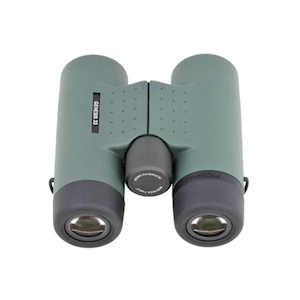 Schmidt-Pechan Prism & Coatings Many binoculars in the middle-upper range feature BaK-4 prisms made of superior glass to produce clearer images, but Kowa has gone one step further and incoroporated the Schmidt-Pechan prism design that have both BaK4 and SK15 prisms. This prism design is more compact, but has a few drawbacks. One of which that the two prisms are separated by an air-gap and one surface of the Pechan prism does not provide total reflection. To get around this Kowa have added their own highly reflective multi-coating they call the C3 coating that gives a reflectance of 99% or more across the entire visible spectrum. On top of this Kowa uses a phase-corrective coating on the Schmidt prism that prevents the loss of contrast and resolution so that colors appear much more accurate. It is a feature that is only found on high end roof prism binoculars.